high-performance and high-quality outdoor apparel and equipment since 1946. 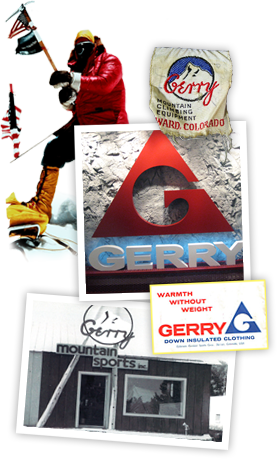 Gerry was started in the mountains of Colorado and the brand�s innovative products paved the way for the active performance fashions on the streets and the slopes today. Gerry was founded by Gerry Cunningham, an avid skier and outdoorsman, with an innate passion. He was serving in WWII and immediately became aware of the need for sophisticated backpacking equipment. He long had a penchant for designing and building better hiking and climbing gear. He started inventing things out of his own necessity and as a solution to people�s outdoor needs. Gerry�s rich history put the brand on the map as one of the true original outdoor brands. The passion and drive of Gerry Cunningham�s legacy will progress the brand into the future. Gerry will continue to provide cutting edge style and elite quality, while staying true to the brand�s heritage as an outdoor innovator and leader.